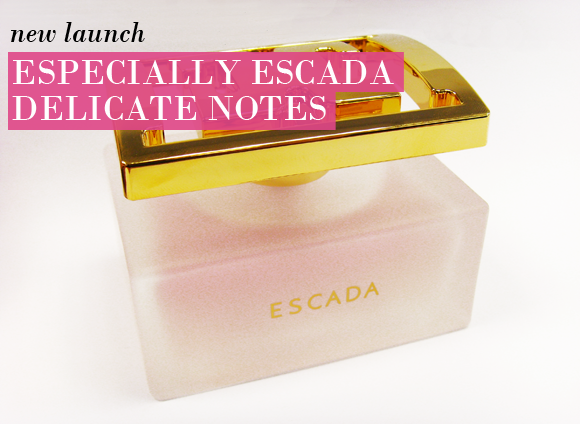 Experience romance with Especially Escada Delicate Notes, a new interpretation of the original Especially Escada fragrance. The sparkling, spontaneous fragrance is a perfect evocation of casual luxury. With notes of pear, fresh dewy rose, ylang ylang and musky notes, it is a fragrance that laces the skin with the most beautiful subtle scent. The lighter concentration of this fragrance is perfect for the summer. It is especially lovely for those who appreciate rose essences – where the Especially Escada Eau de Parfum was more of a floral medley, this scent is definitely a love letter to the pretty rose bloom. Pear brightens the fragrance without making it sweet, while ylang ylang adds softness and depth. The skin-like dry down of musk melds perfectly with your natural body heat to draw people in. The longevity of the top and heart notes isn’t as lengthy as the original Especially Escada, though the musk base does linger very gently for hours. A pretty scent for those who appreciate feminine and sensual fragrance, but with a softer edge. This entry was posted on Saturday, June 30th, 2012 at 9:00 am and is filed under Fragrance, New products. You can follow any responses to this entry through the RSS 2.0 feed. You can skip to the end and leave a response. Pinging is currently not allowed.